Redecorate your home with plush red elements. a giant ang pow this Chinese New Year. it as the statement piece in the room. 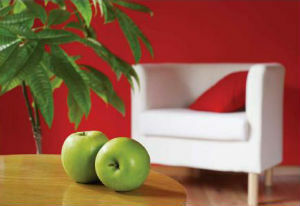 "Choose the narrowest wall in a long room to paint red as this will improve the room’s proportions." colours such as white, navy blue and beige. 3. Layer on the fun. 4. Do not be monotonous. and pillows to create a style of your own. Chinese New Year will be blown away by your simplistic yet chic style. Good luck!